Bible Cartoons: Vision, prayer, success & failure: Why is this happening to me? Very good & helpful “Word for Today” (W4T) article from UCB – see below. Well worth a read if you struggle with vision & the journey towards it. This really got me thinking about my own vision & journey. The Bible says: ‘The Lord answered [Isaac’s] prayer, and his wife Rebekah became pregnant. The babies jostled each other within her, and she said, “Why is this happening to me?” So she went to enquire of the Lord. The Lord said to her, “Two nations are in your womb, and two peoples from within you will be separated; one people will be stronger than the other, and the older will serve the younger”’ (vv. 21-23 NIV). Even when your vision is born of God, you’ll experience times of both faith and fear. You can have clarity in one area, yet experience confusion in another. What should you do when this happens? Do what Rebekah did: take it to the Lord in prayer. She asked, ‘Why is this happening to me?’ Question: Are you experiencing fear and foreboding in the middle of your success? Are you wondering, ‘What’s wrong with me? Things are going well, so why am I anxious?’ You’ve achieved some success and things are starting to come together after a long, hard struggle. But instead of feeling happy, you’re disappointed because you’re not experiencing the joy and fulfilment you expected; you’re actually worrying about what might go wrong in the future. In every success story you’ll find chapters of uncertainty. And when it happens, you must bring your turmoil to the Lord. Ask Him for help with the inner conflict you’re experiencing, and to give you peace concerning the vision He’s given you. And remember—no matter what you achieve, its ability to satisfy you is limited. No amount of success can ever take God’s place in your life. [Edited, emphasised & chopped about me W4T article!!! My notes & observations appear in square brackets [ ] after the quoted part of the W4T article (in box). The Bible says: ‘The Lord answered [Isaac’s] prayer, and his wife Rebekah became pregnant. The babies jostled each other within her, and she said, “Why is this happening to me?” So she went to enquire of the Lord. The Lord said to her, “Two nations are in your womb, and two peoples from within you will be separated; one people will be stronger than the other, and the older will serve the younger”’ (vv. 21-23 NIV). Even when your vision is born of God, you’ll experience times of both faith and fear. [Important point: Don’t confuse getting a vision (received from God) with an unrealistic expectancy that we will not encounter any opposition, times of difficulty, or “rough seas” as we voyage towards that vision. You can have clarity in one area, yet experience confusion in another. [A vision (from God) for our future goal provides clarity of purpose, but not necessarily clarity of the route to take in order to get to the goal. There could be multiple routes to take to get to goal’s end. So confusion & uncertainty is to be expected, particularly during the initial stages of the voyage towards the vision’s achievement. We may receive guidance from the Lord regarding a particular point or leg of the route we are to take. Guidance from God comes especially if we have prayed about that issue: we have sought God’s guidance specifically. God is faithful & wants to help us, after all. He wants us to succeed. Even so, God rarely provides us with the entire route we are to take. In fact, sometimes it is difficult to know what to do in one single day of the journey, let alone what course to set in order to complete the whole voyage! Perhaps that is so that we continue to rely on the Lord for his input & guidance during the whole journey, rather than receiving a complete route “download” & then relying on ourselves to get to the end of the voyage! We are much more likely to strike out on our own (without reference to God) if we think we know what we have to do today & for all the days of the journey, to reach goal’s end. 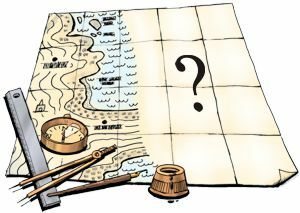 God knows where we are going & has perfect sight of all the pitfalls… whilst we do not, so it makes good sense to “check in” with the Master mariner often, in order to check our progress. Minor (& major!) course adjustments can be made in reference to the “up-to-the-minute” route corrections that only God can provide. Of course this assumes that we are in the habit of trusting that the Lord will provide us with the vision, course & corrections along the way, & that we are in the habit of doing what God says when we think we have heard Him! It shouldn’t come as any surprise that we can have “clarity in one area, yet experience confusion in another” really. We (often mistakenly) assume that vision given to us by God will include a detailed route plan, that somehow guarantees perfect, flawless decision making on our part, on the way to the goal. But that is not necessarily the case. Are we certain that we have always “heard” God’s instructions perfectly in the past? I certainly haven’t! And there is always the tendency for us to go off on our own without reference to God & his divine wisdom… that usually gets us into troubled waters! “Clarity in one area” will bring hope & confidence, which then leads to motivation, drive, action, etc. All of which is good at taking us closer towards our goals. But on the flip-side, that same clarity & confidence (sometimes expressed as “I know what I’m doing & where I’m going, I don’t need your help (God)”) has the potential to carry us away from the Lord, & cause us to get further & further away from His loving concern & wise counsel. It’s as if we “drift out of the safe harbour” of close fellowship with God, & continually have to be reminded to come back towards the safe harbour, in order to be refreshed by God & his presence! Therefore, since clarity can cause that adverse & unintentional drift away from God & his love, I wonder if “experiencing confusion in another (area)” is allowed to happen to us, when we aren’t listening to God, so that we falter, slow down, or even stop in our tracks. But hey, how is that good for us?! Well, if that confusion causes us to pause & re-establish contact with the Lord, (chugging back into the safe harbour!) then confusion may be the Lord’s way of gently guiding us back towards his loving arms & the experience of confidence we get when we are close to Him & in his will once more. All God really wants, is for us to be in constant communion (communication & loving relationship) with Him: He has such good things in store for us, but accessing those gifts & heaven-sent treasures only really comes about when we choose to remain close to the gift-giver, which is God Himself. Question: Are you experiencing fear and foreboding in the middle of your success? You’ve achieved some success and things are starting to come together after a long, hard struggle. But instead of feeling happy, you’re disappointed because you’re not experiencing the joy and fulfilment you expected; you’re actually worrying about what might go wrong in the future. In every success story you’ll find chapters of uncertainty. And when it happens, you must bring your turmoil to the Lord. Ask Him for help with the inner conflict you’re experiencing, and to give you peace concerning the vision He’s given you. [Fear of failure can paralyse us from trying. But success itself can cause anxiety. Achieving a goal can produce performance anxiety, so that we question ourselves: can I do it again, or is this a “one hit wonder”?! The advice here is “bring your turmoil to the Lord”. God wants us to succeed, & He isn’t going to “tell us off” & sound exasperated with us if we confess our anxiety, even when it comes as a result of success, which God has granted to us. God knows us, through-&-through. He knows what we think & feel. It is no surprise to Him that we experience fear both before we succeed & sometimes afterwards too. Therefore, we can be totally honest with the Lord about our feelings, at all times of the journey towards our vision’s completion: before we start towards it; as we travel towards it; once we get there; & after we have achieved it too. I wonder if anxiety is just endemic in the human soul! We get anxious if we don’t have a vision at all. We get anxious if we have a vision & don’t know how to get there. We get anxious if we start out towards the vision’s completion & encounter difficulties on the way. We get anxious if get close to the vision’s completion in case we stumble at the last hurdle. We get anxious if we succeed & reach the vision’s completion. We get anxious if after the vision in case we don’t have anything else to aim for! God knows all this about us – & He has a plan for us, at all stages of the voyage. And remember—no matter what you achieve, its ability to satisfy you is limited. No amount of success can ever take God’s place in your life.